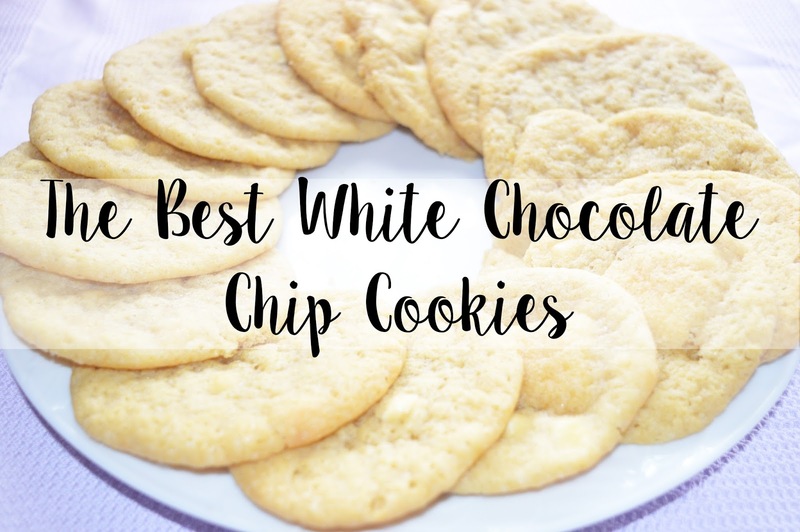 Today I have another baking post for you guys, sharing my favourite white chocolate chip cookies which taste absolutely incredible! After baking these, I left them in my other oven to cool down before putting them into a container, completely forgetting they were in there when it came to dinner time. They were baked for an extra 10 minutes but they were still mouthwatering. Whenever I try out a white chocolate chip recipe, I find they taste quite nutty. I'm not sure if this is to do with the type of butter I use or the brand of white chocolate, but these didn't have that nutty taste, which I was so glad about! It's nice to find a white chocolate chip cookie recipe which only tastes like white chocolate and the gorgeous sensation of warm cookie dough. If you want to find out how to make these gorgeous cookies, then carry on reading! 20 oz white chocolate, cut into pieces. Firstly, you will need to preheat your oven to 180 degrees, and line a baking sheet with baking paper. Secondly, cream together the butter with both of the sugars and then add in the eggs and vanilla; beat this till it is smooth. Next, add in the bicarbonate of soda, baking powder and flour and mix until just combined. Form into tablespoon sized balls placing 2 inches apart on the baking sheet. Bake for 8-10 minutes until golden around the edges. Do not over bake these! Allow to cool then transfer to a wire rack to finish cooling. Let me know if you make these cookies and if you do, send me a picture via instagram or twitter! (@kimmcpherson_ and @_kimberleyjessica). Thank you for reading and I will see you very soon. I'm going to be trying this recipe soon!